I have a confession to make. The only Stephen King book I have ever read is his fabulous book On Writing: A Memoir of the Craft. That said, if you can only read one book about writing, this might be it. Mining some of my favorite gems from this work, I hope to help you polish your own rough stones. “The scariest moment is always just before you start.” I can only echo a hearty “Amen!” Whether I’m working on a term paper, a short article, a book proposal, or an actual book, I always sit down and enter my title, my name, and anything else I know, just to avoid that blank page. Perfection is the enemy of writing. If that’s your initial aim, you’ll procrastinate and you won’t write. You’ll likely never read anything you’ve written and smile to yourself, “Well, there is absolutely NOTHING I can do to improve this beauty!” Nope. Your editor will get a hold of it if you don’t. [Insert evil laugh here.] But when you begin a story, that’s not the time to labor over each word. Get it down. Start. You’ll have lots of time to labor over rewriting and editing later. “The definition of a writer is someone who writes,” declared a now-forgotten workshop leader at my first-ever seminar. Write already. “If you don’t have the time to read, you don’t have the time or the tools to write.” It’s quite possible that I am addicted to reading. I read at stoplights. I read on a float in the pool, in the bathtub, by the stove while I stir things, on my lunch break when teaching, while taking my mile walks, and the last thing before I turn in at night. Reading sparks ideas, allows you to admire fresh turns of phrase, and inspires you to work that same magic, carrying future readers to your setting, helping them to fall in love with your characters. “Amateurs sit and wait for inspiration, the rest of us just get up and go to work.” I don’t remember where I read this, but one novelist wrote that he never writes until he’s inspired. “And I see to it,” he continued, “that I am inspired every morning at 9:00 a.m.” Writing is work. Writing is dedication. Writing is a miserably fabulous craft! “Kill your darlings, kill your darlings, even when it breaks your egocentric little scribbler’s heart, kill your darlings.” When my second book with Harvest House came out, I got the proofs and asked my amazing editor, Hope Lyda, what had happened to some of the quotes and paragraphs I had so lovingly delivered. She was gracious. “Ahem, those went to keep company with some other lonely words and paragraphs.” I see. She had kidnapped and killed my darlings. It was a better book for their absence. All of us have fallen asleep during a long paragraph in which the writer has gotten carried away by his own love of (too much) language. She ran her fingers through the water languidly, indolently, lethargically, lazily….All right already! Crisp. Clear. Concise. “Books are a uniquely portable magic.” Whether we favor Nooks or Kindles or the tactile experience of pages fluttering, bold ink making grand statements and words sweeping us away to other times, other people, other conflicts, when we take books with us, we carry time machines. We carry mini-encyclopedias of knowledge. We carry the life, loves, and losses of characters about whom we are made to care very much. When we write them–ahhh–we are making our own kind of magic. “Writing isn’t about making money, getting famous, getting dates . . . or making friends. In the end, it’s about enriching the lives of those who will read your work, and enriching your own life, as well. It’s about getting up, getting well, and getting over. Getting happy, okay? Getting happy.” The process of writing is not often fun. But we do it anyway. Why? Because we know what books mean. We know they will never go out of fashion. And we are gluttons for punishment, because that book means magic, housed in the pages of something you have been honored to write; imprinted on the hearts of those who read it and won’t soon forget how your words made them feel. And when we write for God’s glory, we surpass even magic. What are some writing truths you’ve learned? 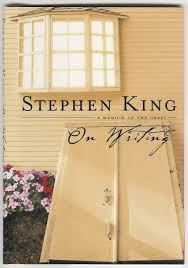 This entry was posted in Writer's Life, Writing, Writing Craft and tagged On Writing, Stephen King by Cindy Sigler Dagnan. Bookmark the permalink. Great reminders here, Cindy. Here’s a powerful truth: “… Words are powerful; take them seriously …” (Matt. 12:36 MSG). Yes, they are, Karen! We need to ask God to guard the door of our mouths and the hands that pen in His name! Amen to that prayer, Cindy! I was looking for your blog at http://www.heritagebuilders.org and was unable to find it? I’d really like to find it since that is what I feel most passionate to write about. Robin…Heritage Builders recently decided not to do the blogs anymore, so I’ll be using that material on the Faith site soon! 🙂 Sorry. Oops, Lynne! Your reply made it down below for some reason! Sorry. I needed to read this blog post. And the quote: “The definition of a writer is someone who writes,” is definitely going to stick with me. Also, I agree wholeheartedly with the last paragraph about books and writing (just like any form of art) being about enriching people’s lives, that is one of the best pieces of “advice”, or insight, I’ve read in a while.